It’s official. I’ve caught the head cold my husband had a few days ago. I had thought that I had dodged it, but no. To make matters worse, I could have been more proactive in preventing this. One of the worst parts of being an herbalist is knowing what plants I could have used to bolster my immune system effectively. There are dosages of tinctures and teas that I should have been downing the moment I knew that Josh my husband was sick. So, instead, dear reader, learn from my mistakes. Colds are going around. Winter is a time for close quarters and the inevitable sharing of bugs the kids picked up from school. Make friends with a few immune boosting herbs at the first sign of a spreading cough. It could save a few sick days. Reishi is a mushroom with a long history of medicinal use. Chinese medicine has used it for millenia. It boasts a long list of medicinal qualities such as helping with asthma, reducing stress, and improved cognitive function. The main ability that is specific to this blog entry is its immune boosting properties. 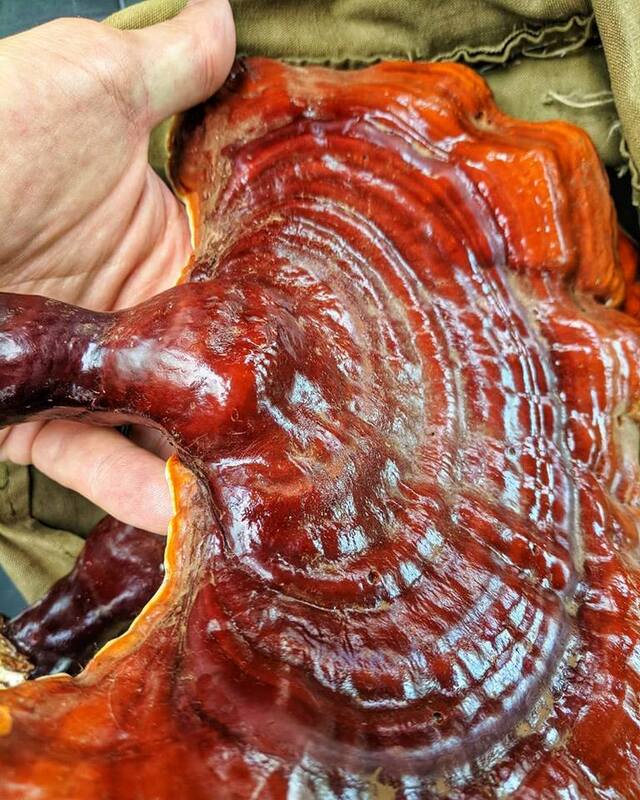 Around my parts, we have a relative of the Chinese Reishi. Its common name is rather plain: Hemlock Varnish Shelf Mushroom. Anyone who knows the scientific name (Ganoderma tsugae) would recognize that it shares the Ganoderma genus with Reishi. Once one sees it, the relation is undeniable. They are amazingly similar in their unique look. They are also used interchangeably medicinally. I remember the excitement I had when I found my first Reishi. I was wandering around the property lines of the forest below my house. As I followed where the growing forest of my property met the clear cut forest of the neighboring property, I felt a pull to head a little farther into my woods. Soon, I came upon an old hemlock stump about five feet tall. There, red waxy shelf mushrooms caught my eye. The strange way that they grew out was unmistakable. I was so excited. I took photos and shared with fellow herb nerds. I had found what has been called the “king of the mushrooms.” The mushrooms were passed, but I knew I had to mark this spot to revisit it later in the year to see if new ones grew. I did my best to mark my return path with fallen birch. Unfortunately, not well enough. I never found that stump again. It would take me awhile to find a new Reishi patch, but this year was certainly my year. Not only was I pointed to a spot with heavy Reishi production 15 minutes away, I also found a spot a few hundred feet from my house. The downside to Reishi? The taste! I would imagine this is what dusty feet would taste like (its smell is pretty similar). Once you get past the taste (and, in my experience, one usually does), it’s an amazing immune support herb. This mushroom is an easy one to identify. To start with, it doesn’t really look like a mushroom. When you come across this mushroom in the woods, it looks like a strange burnt growth off the side of a birch. Should you break into this blackened lump, the woody flesh will be surprisingly bright and golden. This is another one with a litany of medicinal uses, amongst them being immune support. This parasitic fungi that prefers birches and the brutal cold is a slow grower found in northern places like Russia… and northern Vermont. I have a few spots that I am slowly harvesting from in my woods. The taste is far more pleasant than Reishi. We used to make a morning Chaga decoction. 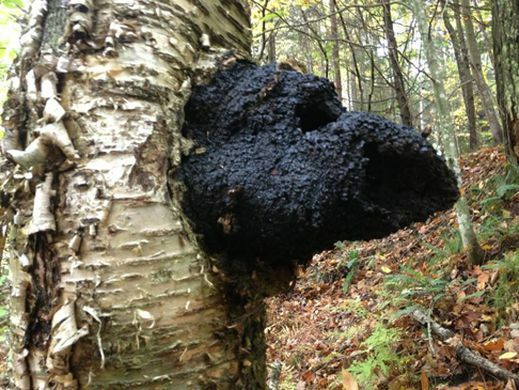 We would take smashed Chaga, put it in a saucepan full of water, and let it sit on the stove at a heat below a simmer. There would be steam and water evaporation, but no bubbling. After leaving that for a bit (a half an hour to an hour), we would strain some and drink. Its dark earthy flavor would be a great way to start the morning. With the busy months that we’ve had, though, we haven’t had the time to break up the most recent Chaga harvest for use. You didn’t think that I would forget about Echinacea, did you? This North American native has been the darling of modern herbalists for a while. With research showing Echinacea root leading to an increase in white blood cell activity, it’s no wonder it’s often suggested as a way to prevent getting sick. Rosemary Gladstar has a fantastic recipe in her book “Medicinal Herbs: A Beginner’s Guide” for a whole plant tincture of the plant that involves making different medicinal extracts from different parts of the plant at different parts of the year, and its formulation strikes me as magical as it is medicinal. It is an interesting process of really working with the cycle of the plant and it is on my list of projects for 2019. Due to the way that it boosts your immune system, it is suggested that this is not an herb to use daily extensively. Use it up to 8 weeks before giving it a break. Let your immune system stand on its own for a bit. Another fantastic way to fight off the bugs going around is Fire Cider. You can read all about that in a past blog entry linked here. And now it’s time for me to tango with one of the best remedies for colds: Sleep! I wish you a good night, and a fantastic New Year. As we get ready for Thanksgiving here in the states, I find this a great time to reflect on gratitude. I have a lot to be grateful for, and I try to express that the best I can to my loved ones and to the spirits that have my back in my practice and my day to day life. It’s good to take the time to step back and appreciate all that goes into us being here. Our food system keeps us fed. Our local water source keeps us hydrated. The land we live on supports us and gives us shelter. Our ancestors and their history of love and life led to us being here. My teacher Adhi Two Owls was up here in the Northeast this past weekend, and she talked a bit about gratitude and offerings to spirit. She told me the story of when her teachers made her make braids for everyone she knew. This was to find the gratitude for what they had taught her, good and bad. She was to then give these prayer braids to them. This simple act of cultivating gratitude while practicing both using repetitive motion to induce a different state of mind and moving energy into something you are creating is a practice that has intrigued me since Adhi first introduced me to it. It reminded me of the knot magic I had read about (a similar act of folk magic). As I played around with it, I could see the energy that I would weave into these braids. I made a few for those I knew, braiding in prayers and love into them so I could give my friends a simple, but loving gift. That’s the easy part of the practice, though, isn’t it? The practice is to give it to everyone you know, not just everyone you like. It can be difficult to honor the gifts that people you dislike have given you, the lessons that they have taught. That part I’m still working on. It’s easy to find gratitude for those you love. Less so when they are someone you don’t. If you want to try making prayer braids to honor those in your life, it’s pretty easy. Find something to braid that is made from natural fibers. Wool, cotton, silk, etc. Not only do these materials hold energy well, you are also working with the plant or animal that it comes from. It’s already imbued with their energy, so, if you have a choice, you can choose what kind of vibes you want to start with. Sometimes, though, what you have on hand is what you have. I have a big bag of embroidery thread. When I’m making a braid for someone, I sit with the colors and try to feel out the appropriate ones. I know, it seems like a lot of thought to put into a simple braid, but that’s part of the magic. Once you’re set with colors, braid. Think of the gratitude you feel towards the person you’re making the braid for. I like to imagine that I’m braiding in Reiki symbols or Runes that would help the person, making the braid a sort of amulet. Once you’re done, tie it off and give it away. This seemingly simple thing has a few bigger applications. Those who have taken my amulet class know that I use these braids in my amulet making process. If you’ve ever seen my drum, you’ll see a whole bunch of different braids hanging from it. Each of those braids represent someone important to me. When I use my drum in healing work, I imagine that those who I have made a braid for receive some of that healing. It connects me to my family, and my ancestors. Sometimes, I braid in certain elements that I want to bring into my life. Bravery. Compassion. Things like that. Then, I wear the braid until it falls off. The tactile beat of braiding might also become one of your favorite ways to find a light trance (getting those brain waves to Theta). I get lost in the movement. This is a moment where you can be open to receiving information, or to be a better conduit for healing energy. For someone who loves using his hands in his work, it’s a favorite of mine. So, I challenge you this week to make a few braids for those who you are grateful for. If you’re into watching the big football game, it’s an easy thing to do with your hands. If you want to really make space and focus on what you’re doing, it’s a great way to find some down time while you digest your big Thanksgiving meal. Give someone a little love and gratitude, even if you can only tell them that you made a bracelet for them, or something like that. I am grateful to you, reader. Thanks for taking a moment with me. May your Thanksgiving be filled with food and loved ones. One of the reasons I love working with herbs is their accessibility. Yes, I can make an herbal product for you, but with the right know-how, you can also make the same product. When you grow or harvest that herb yourself, that makes that self care product your own. You begin to step into the role of your own healer. That’s why I enjoy teaching herbal workshops. I feel like I’m empowering folk in both self care and connection to the plants growing around them. I have a workshop on salve making coming up and I wanted to share a little information about some of the herbs that I will be using in that workshop. These three herbs are easily grown up here in northern Vermont and more than likely can be grown or wildharvested where you live. This lovely yellow-orange flower is an attractive annual that is pretty easy to grow. It’s even been known to reseed itself in my garden to unexpectedly surprise me the next spring. Happy to live in a flower bed looking for a touch of gold, this beauty is also well known for its medicinal qualities. One of the first things that you will notice after harvesting a few of these flowers is the sticky resin. That’s the medicinal magic of this herb. This herb is known for its skin healing properties, as well for its antifungal and anti-inflammatory abilities. It is gentle enough for the skin of a baby, but the first herb that comes to my mind in speeding the healing process for bruises. It’s also used internally for complaints like diarrhea and lymph issues (as well as a lovely edible garnish for salads), but for today I want to focus on how it’s one of my go to herbs for salves. There are a lot of beautiful varieties of calendula out there, but for the purpose of medicine the most resinous tend to be the yellow-orange varieties. Usually the seed catalogue that I order them from mentions the most resinous (and therefore the most medicinal) variety out of all that they offer to make it easy. If you are just buying the flowers harvested and dried, then I’m sure the variety that the company is offering for medicinal use is appropriate. When I acquired my first comfrey plant over a decade ago, I was sure that I had found the perfect spot for this vigorous perennial. I distinctly remember my friend Annie dubiously watching me with the plant, warning me that I should choose the spot carefully. Once it was in there, I wasn’t getting it out. I don’t think I properly believed her warning. Now, years later, my planned comfrey patches are nowhere near that original plot, as that spot is part of my larger garden. The comfrey doesn’t care. I weed it intensively every year. Every year, it returns. Comfrey is an amazing herb. It also seems to be borderline invasive if you don’t give it a spot with clear borders (like a mown lawn). It has a long history of medicinal use that is revealed through its older common names like knitbone and boneset. The plant contains high levels of allantoin, a constituent that promotes cell growth. This is why it’s amazing in salves. It can speed the healing process of cuts and wounds. While the debate about certain constituents known to be harmful to the liver in high amounts that comfrey contains still continues, it is generally considered safe for topical use. The research often cited involves incredibly high levels of said constituents (specifically pyrrolizidine alkaloids, if you’re feeling sciency) tested on rats. While I don’t know of any examples involving people taking normal dosage, it is still usually skipped in medicines that are taken internally. When it comes to using comfrey in salve, I believe we do far worse things to our livers on a day to day basis than apply comfrey salve to a wound. This plant can be found in fields and roadsides across Vermont. The Latin name perforatum comes from the fact that when one holds a leaf of St John’s Wort up to the light, little pin pricks can be seen. These holes are actually oil glands. This plant is another one with a long history in both medicine and magic. I happen to use it for both. Focusing on the medicinal side of this amazing plant, it is the flower and the flower bud that is used for salve. You know the flowers are ready when you squeeze a flower bud and it “bleeds” a dark purple sap. When extracting the flowers into an oil for use in a salve, the finished oil takes on a rich red color. This herb has been used topically as an antiseptic and a ally for nerve healing for centuries. I recall a story (though I can’t remember where I read this) a story of soldiers on the way to one of the Crusades packing a sack of oil with these flowers before they left. The sun would beat down on the oil sacks and extract the properties of the flowers as they traveled. By the time they reached Jerusalem, the now red oil was ready to help heal any wounds that would be inflicted on the soldiers. This herb actually has a lot of interesting Christian lore attached to it (which is unsurprising considering its name and solar energy). If you’re interested in reading one a story that connects it to Jesus and Mary Magdalene, click here. To use these herbs in a salve, you have to infuse them into an oil. To learn that art and how to turn those oils into salves, there are a lot of places to find information and recipes to try out. Or, you could sign up for my workshop on the 18th at 6pm by emailing me at greenmountainmaeg@gmail.com . If you live close by, I’d love to have you at the workshop. The Shaman I am apprenticed to often talks about the conversation that is happening around us. Trees interact with each other via the massive network of fungi that connects the forest. There is an interaction between plants and the soil type, seen by noticing what plants grow where. Red squirrels are always chattering at intruders, giving away the intruders location to the listening ear. There is so much information that can be gleaned from around us by just noticing the way that life and the elements are interacting. We, as humans, are so dependent on conversation and interaction. The importance of relationship between us, our food, and our planet is often understated. We like to think of ourselves as beings outside of the feedback systems of the ecosystem we live in, but nothing could be further from the truth. When it comes down to it, we are a very cunning, social species on the planet earth who may just be in over their heads. I’ve been thinking about relationship a lot recently. As my family and I were out doing errands, an interesting TED Talk came on the radio. It was an author named Johann Hari delivering a speech called “Everything You Think You Know About Addiction Is Wrong.” Essentially, he speaks about the roots of addiction in disconnection. It was fascinating, although some see some errors in his train of thought. It struck me as something rather shamanic. Part of the role of the Shaman is to help heal and build community. It is about finding, strengthening, and creating connection. Connecting to the world of Spirit is only part of this. As I mentioned, we are social creatures. We need connection to each other, to the world around us, and to some sort of purpose. When we lose that, we try to find connection in some other way. I’m not suggesting that this is the only reason for addiction, by the way. There are real chemical and biological components involved. There is language in shamanic practice to cover those aspects, too. What people might call a “family curse” could really be a genetic predisposition to a problem. The chemical hooks of a chemical are part of its “spirit.” We fall in danger of those hooks when we lose correct relationship with a plant or substance. I’m a firm believer that everything has its use, its place in an ecosystem. Even illegal drugs have a medicinal side. When used correctly, we use opiates to deal with pain when it becomes too much. Cannabis has medical uses, just ask any medical marijuana enthusiast. Hallucinogens have their place in different indigenous spiritual traditions. Even cocaine is derived from Coca Leaf, a plant with a strong place in certain South American cultures for its benefits. Alcohol is a great extractor of herbal medicines, and can be used to open people up to themselves and others. It’s when we fall out of correct relationship with these things (or change the plant to become something that it was not meant to be) that it becomes a problem. We as Americans aren’t that great with relationships, though. Maybe it has something to do with the loss of connection to Spirit, and the loss of connection in community. Maybe it’s the way that we structure society now. Maybe it’s the vapid nature of social media. Maybe we are experiencing a loneliness epidemic (though loneliness and connectivity are not synonymous). Maybe it’s just the way it is. I don’t know. I do believe that connectivity and community are important healers to the heart sickness that seems to be growing in our world. I think that the world needs connectors and healers now. I’m still trying to figure out what my part is in helping to connect and heal the world about me. What do you think the world needs right now? Chakras come up a lot in energetic healing, and I thought that they might be an interesting topic to tackle. Chakras are points in the energetic body where certain energies pool, making a sort of vortex. If you ask someone in the spiritual community about chakras, a good portion will tell you that you have seven chakras, starting at around the base of your spine and ending at the top of your head. They are assigned different colors of the rainbow, red at your base chakra to violet at you crown. This model of chakras has been popular for a number of years, and people sometimes mistakenly believe that it is the only model. The idea of seven chakras come from the yogic world, but is by no means the only chakra map from yoga. It has an interesting history that, if you are interested in it, you can read more here. Energy centers have a wider history than India, though. Chinese medicine works a lot with energetic meridians. Qi Gong works with a few energetic centers (that overlap with a few of the chakras). Different Western Occult traditions have their own energy points and pathways that they focus on. When I first learned Reiki (the energy healing technique with which I began my training), I was taught about the seven chakras that are popular in many Western alternative healing modalities. I learned about body and emotional connections to each chakra. It’s an interesting marriage, Reiki and modern yogic chakras. When Reiki was founded by Mikao Usui, he taught specific ways to place your hands when giving someone Reiki. While there was an overlap in hand placement and where chakras are understood to be, I don’t believe any of his work had anything to do with the seven chakras. I surmise that they found their way into Reiki around the time it came to the states. Because I was trained to feel them when doing Reiki, as well as trained to feel them in myself in my scattered early years of esoteric research, I still often use them when doing energetic work. I associate different energies with different points on the body. I am left wondering how much of that is how our auric bodies are, and how much is just how I associate energy and place on the body. I also use minor energy points in healing work, such as the ones found at your hands, feet, elbows, and knees. I have also mentioned different chakra work I do in ritual. When learning the rituals of the Ancient Order of Druids in America (AODA), the first two energy points we are taught to focus on are the third eye and the solar plexus. The third eye connects us to our spiritual senses, while the solar plexus has connections to self (and, as my teacher Adhi like to point out, service). After a while, AODA ritualists begin to store planetary energies where their sacral chakra would be located and solar energies where their heart chakra would be located. Eventually, you use those two currents to create a third, stored where your third eye chakra would be. John Michael Greer, the author that revived the work of the AODA, mentions the different chakra systems. He suggests that it is better to focus on select chakras as points of power, so your internal energies aren’t stretched trying to strengthen a whole bunch of power points. seems to also be a popular one, though some systems move that energetic point closer to the physical heart, on the left side of one’s chest. Though I work mainly with the seven popular chakras, sometimes I’m directed to unexpected parts of the body or aura when doing energy work. Everybody is different, and everyone has their own certain auric quirk. My job as a healer is to roll with it, and listen to what my client’s energy is telling me. Let me know what your experiences are with chakras. I would love to hear a different perspective. Stay warm out there. It’s frigid up here in the North. Winter has arrived. In the Shamanic work that I do, one of the first things I learned from my teacher was to shake a rattle. No, not like an infant’s rattle (though I imagine you could use one, if you needed a rattle real quick). Something more like this. You take a rattle that makes the right kind of sound you’re looking for, and shake it until you start seeing things. Okay. It’s a little more complicated than that. When a healer is shaking a rattle (or drumming), they usually do so in an even beat, while channelling earth energy through their tool. The repetitive nature of the sound is to lull your mind into a different state (usually Theta brainwave state) to access more subconscious levels of the brain, as well as interact with spirits. It’s usually referred to as Shamanic journeywork. It’s a great healing tool, as well as a way to access knowledge not easily accessible to our conscious self. I had heard of using sound as a way to access a sort of trance state before I took on my Shamanic apprenticeship, but I had only heard of people using drums. When I met my teacher, Adhi, I was surprised to learn that she used rattles more often. Her teachers had taught her that drums were for putting a person back in the body, while rattles were better suited for journeywork. Not that drums can’t have the same results, it’s just the two different tools have very different energy. So, I began to practice with what I found in my house's pile of musical instruments. I remember the first time I brought the tools that I had been using to Adhi’s. She did her best not to laugh at the cheap maracas that I had found. They were quite ridiculous looking, but they did the trick. My first real rattle was the one I made on Assateague Island with Adhi and a handful of other participants. I was looking for a deep sound. What I made had a sound reminiscent of a box of quarters. Again, it did the trick, but it was not soothing. Eventually, I decided it was time to make another rattle with a more gentle sound. I began with a goat rawhide Adhi had gifted me. I made offerings to the spirits in the water that the rawhide soaked in. I went to my Burden Tree, another part of my Shaman work. She’s a maple tree that is over one hundred years old that I work with to balance myself and connect to nature. She had lost a small limb, from which I cut, shaped, and sanded a handle. I stitched my rattle head from the now pliable rawhide. Once that was fully formed and dried, I poured kale seeds from a second year plant that I had grown in my garden. I sealed them together, tying them with the four colors I use to represent the four elements. It had a great, gentle sound. I loved it! Within a week, I accidentally dropped it and stepped on it. While still sounding great, it has a “unique” look. The beat up look has yet to discourage me in its use in healing work. It’s one of my favorite go to tools, unless I need to use a tool to move out blockages or dense energy from a client. Then, I resort to my loud sea rattle from Assateague. Usually, journeywork is done by a client while the practitioner rattles or drums. When I do my daily rattling practice, I am aiming to go deep enough that I do see things that I can’t normally see. It’s been years of practice, and I just recently started seeing things while my eyes are open. When I have a client on the table, I can also use my rattle as a way to move energy. While I can (and have) done energy work without tools like a rattle, it does make the process easier. And that is my rattling practice. If you ever have a session with me and you hear me break out my rattle, now you know what I’m doing. Have a beautiful week. Stay warm. This has been an interesting week. Between Josh (aka “The Rune Goon”) doing a bunch of readings for people, and a handful of clients coming my way for healing work, we’ve been busy in the esoteric world. In fact, the joke that Josh and I had going that he lays down the hard truth and I do the work to help them deal with what they’ve learned seems less like a joke. A Rune Goon and Green Mountain Mage tag team? Seems like there might be something there. I had the privilege to work with some amazing people these past few days. Interestingly, the work all seemed to have a common theme: unhealthy energetic connections. People in this line of work refer to these connections as cords, and that’s what I’d like to talk about today. We all energetically connect to others. That’s part of daily interaction. We talk about people opening up to us when they start really sharing where they are at, and that is exactly what is happening energetically. You’re opening up to another person’s vibes as you share yours. Opening isn’t an unhealthy thing. It’s super important to us as social mammals. We thrive on healthy energy exchange! Energetic interactions can become unhealthy when there is an unfair exchange. We can unhealthily lean on someone. These people leave you feeling drained after every interaction. They talk about their problems without looking for a way to fix those problems. They just want your compassion and, usually unknowingly, your energy to replenish theirs. They leave the conversation feeling great, while the person they engaged feels wiped. There is the other side to this coin. Unless a person is very good at taking your energy, they didn’t take it without some sort of consent on the giver's part. That’s usually someone with a big heart and with a knack for empathy. They feel the pain the other person is experiencing and, in an effort to help “fix” the person, they open up and give of themselves. Neo-shamanic practitioners talk about giving away pieces of your soul. I don’t know if you can give away your soul, but you can give away energy that you need for yourself. The thought that the person you are listening to needs it more than you is almost a subconscious thing. This is not true. It is also not helpful. By the way, I used to be one of those people. I think that it’s an easy trap for people sensitive to the energetic exchange to fall into. In the end, though, it doesn’t do much to help the other person, and just leaves you unwhole and unwell. Being in the role that I’m stepping into, it’s true that once a client steps into the room we are doing work in, it ceases to be about me. It’s all about the client and the spirits for the allotted time. My work is to open up my client so we can find what needs work. There is also an unequal energy exchange, though not unfair, as this is part of the process the client has signed up for. The difference is where the energy is coming from and the end point of the work. In Reiki work, we are taught to channel energy. That skill has been reinforced in my life with my ceremonial work. Tools, such as drums and rattles, also help me move energy without depleting myself. In fact, I often feel on top of the world after a session, as the energy nourishing my client is also nourishing me. Also, at the end of a session, I try to give my client homework. This is putting the ball back into their court, and reinforcing that we are our own healers. It is also part of cutting any energetic ties created in the session. I can ride the emotions with you, but at the end of the allotted time, they are yours and not mine. Talking about energetic ties brings me back to the cords that I spoke of at the beginning of this blog. Sometimes, a strong, unbalanced relationship can form. When there is a repeated unbalanced interaction, it can create an energetic cord between people. This link feeds a person while draining another without the two being in the same room. A good energy healer can feel these cords on their clients, and sever them. Unfortunately, sometimes those cords are recreated the moment the client leaves the healer (why homework and post table work discussion is so important). These cords, in rare cases, can also be consciously formed. There are people out there who are willing “energy vampires” and justify to themselves taking people’s vitality from them to use for their own purposes. You’ll know when you meet one of these people, and they’ve attached to you. You’ll feel drained and just weird, wondering why you feel like you’ve been hit by a truck. If a person is making you feel like that, it’s best to cease interaction best you can with that person, and have strong energetic boundaries when you do interact with that person. It might also be helpful to head over to a healer you trust, and talk to them about it. Stand and breathe. Still your monkey mind. See the sun (or the light of God, or whatever celestial source of good juju you work with) in your mind’s eye shining bright above you. See a light descend. Pull that light into your head. Pull it down to your solar plexus (or heart, if that feels right to you). Light pools at the chakra you’re working with as the beam of light continues down to the heart of the earth. Feel that pool of light at your solar plexus or heart strengthen and expand past your body. Any cords attached to you is severed from your body by the expanding light. Soon, that light has enveloped you, moving any bad juju away from you. See those cords detach from the other person (no need to even visualize who it is, they’re just some shadowy figure in the distance). Offer it to the light above or the earth, whichever feels best. Know that is will be recycled by whatever you just gave it to. The sphere of light you are in is moving about you, moving all unbalanced energy around and away from you. The easiest way to deal with cords is to not let them form. It can feel good to be needed, and I think that is part of the reason these cords are formed. Helping people is a good thing, but helping them stand on their own two feet is even better. You cannot pour from an empty cup, so create safe boundaries for everyday interaction. If you are feeling drained by a situation constantly, there are boundaries that need to be set. You can listen, and even experience emotions with others. That’s part of the work. In the end, though, don’t own it. Hope this helps a little bit. With Thanksgiving coming up, the next week is crazy for me. So, I will not be posting a blog next week. Next blog entry will be up December 1st!! Have a great rest of November.